I came across the above sculpture in an art magazine from Fort Worth, Texas. How I came across an art magazine from Fort Worth I cannot fathom, or recall, but until that moment I'd never confronted the notion of artwork in Fort Worth. 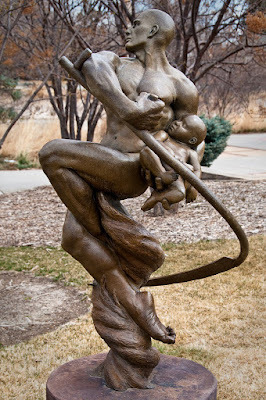 It was a terrible thing to ponder, and I must say the art in the Magazine generally served to confirm my worst fears, but of all the atrocious art featured, one piece stood out - the absolutely appalling 42 inch bronze sculpture, Harvest, by Seth Vandable. I must admit it has a certain power; in fact I was staggered at first sight of it! How in Gods name, I asked myself, could a single artwork embody so many "iconic motifs?" The sculpture (depicted above) is of a bald, heavily (one might say over-muscled man) leaping into the air, as though he were light as a feather, with a sort of ecstatic gusto, like a ballerina. Yet, not only can he leap like a ballet dancer he can harvest wheat at the same time! For over his shoulder rests that great symbol of rustic virility, the grain scythe. In spite of the balletic overtones, this gives the sculpture a decidedly masculine air. Yet again, there's something more about the thing with the scythe. There's a bit of a hip, racy, perhaps even slightly communist aspect to it, which gives the whole thing that bit of necessary controversy, that bit of essential cachet. Oh, wow! I get it! He's not just a bald, body-building, ballet dancer, who can dance while harvesting grain with rustic implements, he's also a political activist! (As everyone is in America today, and probably nobody will be again tomorrow, or whenever they feel that that's what's expected of them). Well, probably he's not an actual communist (this is Texas after all,) but maybe a little inclined towards politically correctness of some kind or another. Whatever. At all events, the artist has really covered some ground here! A bald, virile, ballet dancing, body building, rural rustic, sod-buster, with a political edge! Who'd have thought it possible? But wait, there's more. He's also, apparently, trying to nurse a baby! Wow, this guy can really do it all. He's a bald, virile, ballet dancing, body building, rural rustic, sod buster, with a political edge, who's also trying to nurse a baby! Now this is a man for our times, a real multi-tasker! And I bet he does it all for $7. 50 per hour. This is Texas after all.